We are committed to producing the finest quality ingredients. 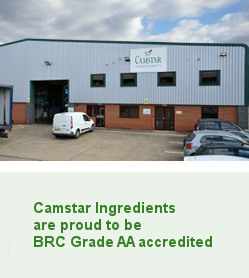 Camstar Ingredients Ltd was formed in June 2012, combining Edward Starke's wealth of experience in wet and dry ingredients preparation and Ben Land's in depth knowledge of production techniques for both wet and dry products. We are a dedicated team of people committed to meeting and exceeding the high demands of our trade partners and consumers through exceptional market understanding, superior customer service and inspirational product development. Our terms and conditions are available, please click here.